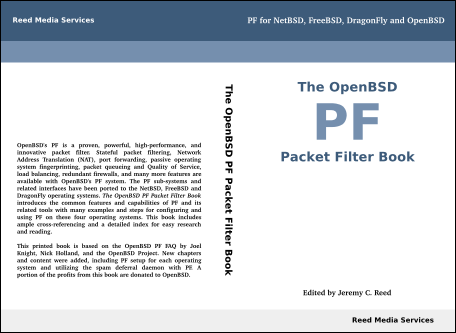 Order The OpenBSD PF Packet Filter Book from Lulu, Amazon, or your favorite book store. Purchase The OpenBSD PF Packet Filter Book from Lulu, Amazon, or your favorite book store. The book is based on the freely-available BSD-licenced PF FAQ as provided by the OpenBSD project. It includes many grammar, spelling, punctuation, and formatting fixes, and numerous content improvements for (hopefully) easier reading and comprehension. Many fixes were sent to the original copyright owners. In addition to the detailed proofreading, editing and reorganization, this PF book provides new chapters and more content to better explain and further document the use of the PF-related tools and capabilities, especially for non-OpenBSD systems. Differences between the behaviour, setup and usage on the different operating systems are covered. And some old or deprecated features or syntax are covered as needed for the non-OpenBSD systems. Some of the new content includes: PF installation and setup specific to NetBSD, FreeBSD, and DragonFly; new graphical diagrams; and using the spamd suite with PF. It has approximately 15- to 20-percent new content. The 21 chapter book is available in a convenient printed format using standard perfect binding. Numerous cross-references were added and the book includes an eight page index with over 435 terms and concepts indexed for easy study. A portion of the profit from the sales of this book are sent to the OpenBSD project. You can learn more about donating to OpenBSD at http://www.openbsd.org/donations.html. Reed Media Services actively donates money and time to various BSD and open source projects.